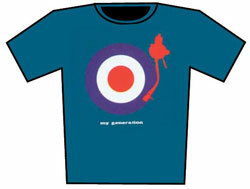 Something for anyone that fancies themselves as a mod DJ – the My Generation DJ t-shirt. It’s made by DJ firm DMC and is in "denim blue", with red, white and blue target, along with red turntable arm. The shirt is made from 100 per cent cotton, is one size only (you might want to check what size) and is available from Hard To Find Records now for £15.95.